Manny Pacquiao and Adrien Broner are set, but the undercard has a new matchup. 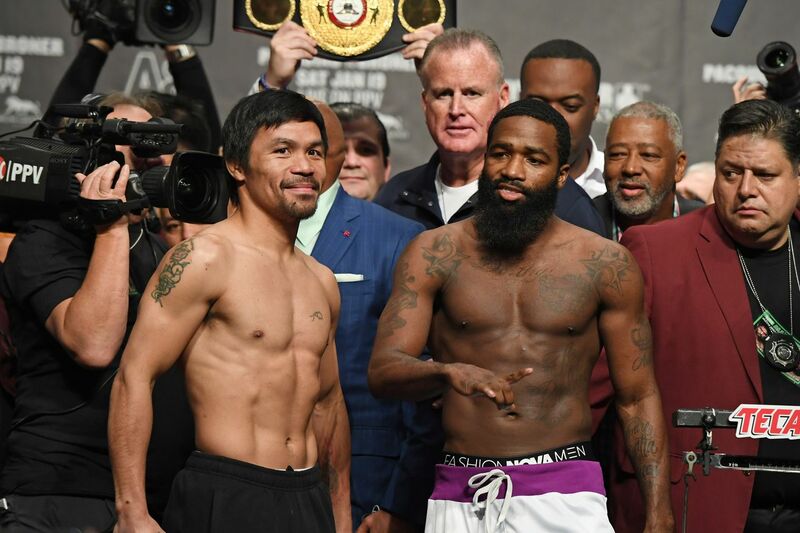 Manny Pacquiao and Adrien Broner both made weight for tomorrow night’s Showtime pay-per-view main event in Las Vegas, but the undercard has seen a change due to one fighter missing weight. Jhack Tepora was to face Hugo Ruiz in a 12-round featherweight bout to open the pay-per-view portion of the card, but Tepora weighed in 5.5 pounds over the limit, and has been replaced in the bout by Alberto Guevara (27-3, 12 KO). Guevara weighed in at the limit of 126, and Ruiz (38-4, 33 KO) weighed in at 125. Pacquiao (60-7-2, 39 KO) weighed in at 146 pounds for the welterweight main event, where he’ll defend the WBA “world” title against Broner (33-3-1, 24 KO), who weighed in at 146.5. The other two pay-per-view bouts are also good to go. Badou Jack (22-1-3, 13 KO) and Marcus Browne (22-0, 16 KO) both came in at the light heavyweight limit of 175 pounds. Rau’shee Warren (16-2, 4 KO) weighed in at 116.5, with Nordine Oubaali (14-0, 11 KO) at the limit of 118 for their vacant bantamweight title fight.